Q: Is the Midewiwin Society just as important as it was in the “pre-reservation” period? A: Unfortunately, as a whole, the Midewiwin and all aspects of indigenous Anishinaabe culture are no longer practiced in many communities. Although most community leaders and Elders will say it is just as important. For those who have chosen to live a traditional lifestyle, and have chosen to rekindle their lives with their own spiritual ways, history and teachings – the Midewiwin is just as important as it was in the pre-colonial period. Prior to the arrival of Europeans, in many communities, the Midewiwin was integrated in all facets of Anishinaabe life. The Midewiwin lodge was the source of our governance, through the clan system. The Midewiwin lodge was where we prayed. It was where our children and our people were educated through traditional teachings. It is where we were given our names and where we were married to our spouses. It was where we went to healing, counsel and fellowship. It was where we held our social gatherings. At the end of our days, the Midewiwin lodge was where we had our funerals. Even those who had not been initiated in the Midewiwin society – came to the Midewiwin people and the lodge for these things. However, following the arrival of Europeans and the imposition of colonial society and laws, the Midewiwin took a back seat to Christianity, western governance and modern ways of life. The Midewiwin were portrayed by the civilizers as heathen and even satanic. Midewiwin members took their ceremonies and traditional ways underground, away from the community. This abrupt change in culture meant poverty, hardship, spiritual confusion, alcoholism and cultural assimilation. Into the 1800s, children were removed from communities into residential schools to learn Christian and western ways. Eventually, the Midewiwin reverted into a secret society, kept by only a small number of devotees. It was nearly lost. Today, most Anishinaabe communities are Christian. Very few actually know their history and their indigenous culture. Even fewer can speak and understand the Anishinaabemowin language. Only a small number of families choose to live and raise their families in the traditional way, as Midewiwin. For example, in my community of Nipissing First Nation – with a total membership of over 2,200 – the vast majority of individuals are Christian. Less than 5 percent can speak their language. There are only about a dozen Midewiwin people that belong to the Three Fires Midewiwin Lodge. While two or three individuals belong to other Midewiwin lodges. Although some people are becoming more aware of their own Anishinaabe culture and take part in pow-wows, very few attend the Midewiwin lodge. However, being Midewiwin requires a significant committment, flexibility in work schedules in order to attend ceremonies and gatherings and significant travel. Midewiwin gatherings are held across a vast territory extending from central Ontario to southern Manitoba. Today, there are only a small number of functioning Midewiwin lodges, mainly is Minnesota, northern Wisconsin and northwestern Ontario. The Three Fires Midewiwin Lodge, led by Grand Chief Edward Benton-Banai, is the largest Midewiwin Lodge with members from Wisconsin, Michigan, Manitoba and Ontario and a handful from other territories and nations. Typically, attendance at regular ceremonies is 300-400 people. The Three Fires Midewiwin Lodge initiates, on average, 40 new members every year. Q: Is the Midewiwin Society just as expensive for its initiates? A: Today, there is no “fee” to be Midewiwin. The historical aspect of providing an initiation fee and bringing goods to the Midewiwin leaders and members was simply a way of demonstrating commitment to their declaration and showing respect for the Midewiwin Spirit and the society. For example, it was historically the duty of the Midewiwin initiates to hold a feast for the Midewiwin. However, this has changed over the years. In the contemporary Midewiwin lodge, the initiates show their commitment through attendance. They are required to, not only give their declaration, but to attend all ceremonies, commit to learning their teachings and songs and live by certain values and instructions up to a year before their initiation ceremony. They are also supervised by their sponsors, Midewiwin members who guide them throughout their initiation journey. 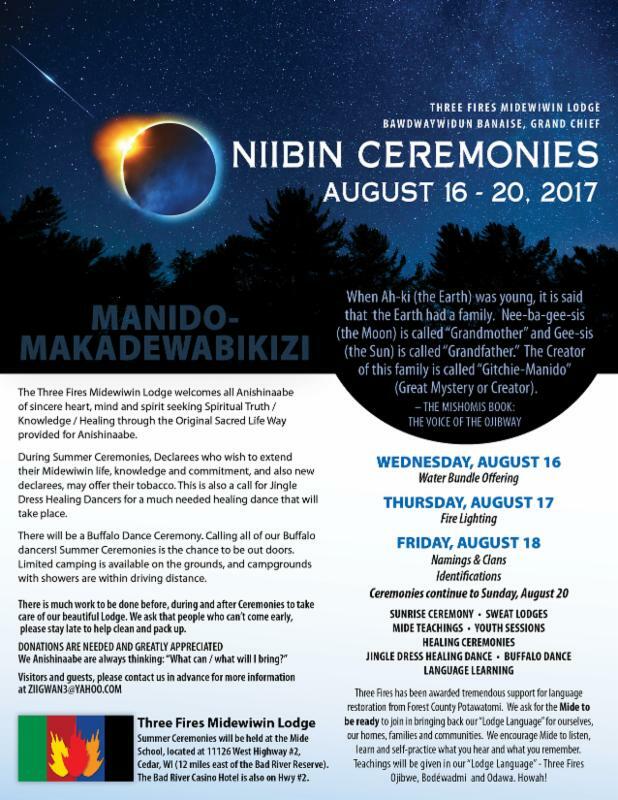 Initiates are still required to provide a feast at each of the four seasonal ceremonies prior to receiving their Midewiwin teachings. However, it need not be expensive or cost prohibitive. Often initiates are helped by their family, their sponsors or other people in the Lodge. A kitchen area is provided. For those without means, food is often donated to help out the initiate. This commitment can be expensive and cost prohibitive in another way. Midewiwin initiatives are required to attend all ceremonies in order to receive their instructions, teachings and songs. The high cost of travel throughout such a vast territory can be an issue. For example, an initiate from northern Manitoba may have to travel to central Michigan, a journey of a 1000 miles. Regularly, members from Nipissing must travel to Bad River, Wisconsin, a journey of 600 miles. However, carpooling and sharing accommodations is common among Midewiwin and initiates. Q: Through my studies I have realized that the Ojibwa people were very spiritual people. My question, do they place spirituality in such high regards today as they did years ago? A: The Anishinaabe are inherently spiritual people. The belief in spirituality, historically, made conversion and indoctrination into Christianity quite effortless. Even though most people are Christian, they are often devout Christians. Even in the face of extreme physical, cultural and sexual abuse at Christian residential schools – the devotion to religion remains unscathed. This inherent spirituality, however, this is not a result of Christian theology. I feel this is a ingrained cultural trait. Often times, when an Elder is approaching death, they may begin speaking in their Ojibway language, despite not having spoken the language in many decades. They sometimes begin to pray to the Spirit in a traditional way rather than their learned, Christian way. Another example of this inherent cultural trait is intense family bonding. The Anishinaabe clan system is a distant memory and has not been used by Anishinaabe communities for nearly 140 years. Today, there is virtually no knowledge or awareness of the clan system. However, the kinship and family bonds in First Nation communities is intense one which manifests itself in historical, clan-like traits of familial closeness, inter-family alliances, political divisions, feuds and community taboos. The resilience of the Midewiwin society is also indicative of this spirituality. Despite the historical challenges, the Midewiwin has survived persecution, the loss of culture, language and sources of knowledge such as Elders, teachers, Midewiwin leaders. However, it was this commitment to spirituality and the Midewiwin society that allowed visionary leaders to hold on to the Midewiwin and restore it in contemporary times. The intensity of Midewiwin spirituality has a remarkable indomitability. The devoutness of it’s members have been shown to overcome many personal and cultural challenges including personal healing, poverty and identity issues. Spirituality and the role of one’s Spirit remains the most important tenets of the Midewiwin. For example: the Three Fires can not only refer to the Ojibway, Odawa and Pottawotomi but also the mind, body and Spirit. Q: In your opinion, how has the Midewiwin changed to fit today’s different challenges? A: Our lodge, the Three Fires Midewiwin Lodge, has been one of the first Midewiwin lodges that have found a way to integrate translation and the occasional use of the English language into Midewiwin gatherings. It was recognized that as a result of assimilation and residential schools, most Anishinaabe people do not speak of understand the Anishinaabemowin (Ojibway) language. When Edward Benton-Banai proposed the use of translation to aide those non-speakers, some were not supportive. This has caused a lot of consternation among orthodox Midewiwin elders. However, when these Elders seen the impact of this approach, and the sheer numbers of young people making their way to the lodge – this approach was accepted and has since shown much success. This led to the publishing of The Mishomis Book in 1979, which was the first english-language printed translation of key Midewiwin teachings, such as the Seven Grandfather teachings, the Creation Story and the first Midewiwin ceremony. However, Grand Chief Benton-Banai’s approach was not to share the teachings and stories verbatim. These concepts were shared through a fictional approach of a Grandfather telling stories to his grandchildren in the English language and in a simple way so that the stories and philosophy were understood. The Mishomis Book is the quintessential resource for young people and those wanted to understand the Midewiwin at a fundamental level. All traditional teachings and all ceremonies are still conducted in the Midewiwin language, first and foremost. However, a courtesy translation is often provided to non-speaking members and visitors. Commitment to learning the Anishinaabemowin language is essential to being Midewiwin. All members are greatly encouraged to learn and use the Ojibway language to the best of their ability. The Three Fires Midewiwin Lodge regularly holds language camps for the benefit of their members. Q: How has technology helped, influenced, or changed the Midewiwin Society? A: The Three Fires Midewiwin Lodge uses a listserv and an online bulletin board to communicate to members and their families. The Three Fires Midewiwin also has a website and a Facebook page. These tools are used to better communicate gathering information, arrange carpools, discuss ceremony logistics and arrangements. It is also a means to promote Midewiwin life to those that might be interested. Many Midewiwin people are everyday people, like artists, students and professions. Many use the internet on a regular basis. For example, I have a blog dedicated to my life, not only as a communication professional and an Anishinaabe citizen – but to share my life as a Midewiwin man. However, traditional teachings and traditional knowledge are not to be shared across these networks. The modern Midewiwin society also has many of the conveniences of home. Our Three Fires Midewiwin School, located in Cedar, Wisconsin has a full-sized Midewiwin lodge indoors so mid-winter ceremonies can be held in comfortable surroundings. The lodge provides a kitchen in the school house as a modern convenience and in order to prepare food safely for hundreds of people. All ceremonies now make use of in-lodge lighting and sound systems. Often times, lodges are created that can be over 100 feet long. So to be able to communicate across the length and width of the lodge requires a reliable, multi-speaker sound system. Modern publishing and academia have provided a forum to bestow the values of the Midewiwin into mainstream society. Internet publishing, books, thesis and texts have assisted in the public education of Anishinaabe culture and Midewiwin spirituality. Museums and collections are more accurately and respectfully portraying the Midewiwin in a proper light. Midewiwin people are consulted on collections, exhibits, conservation and research. Modern approaches to anthropology, archaeological practices and museum policy are now much more inclusive and respectful of Anishinaabe people and their spirituality. This technology and modern conveniences have made the Midewiwin society more accessible and open for all Anishinaabe people. The growth in the lodge in the past 10 years celebrates this fact. Many of these technologies and innovations have led to a first-time awareness of the Midewiwin society and indigenous Anishinaabe culture. This has led to more Anishinaabe people finding their true identity as citizens of the Anishinabek Nation. It has also led to more people attending the Midewiwin ceremonies, funding healing in the Midewiwin lodge, a substantial increase in the number of Midewiwin initiates and more awareness of our Anishinaabe spiritual ways. Q: Is the ceremony still annual? A: Midewiwin ceremonies are held every season. Summer cermonies usually take place in August, Fall Ceremonies take place in October. Mid-winter Ceremonies take place in February. Spring Ceremonies, which is the largest annual gathering, takes place in June. This is when the Midewiwin initiations take place in the initiation lodge. This usually takes place during the full-moon in June at Madigan Park, Bad River, Wisconsin. Other gatherings take place throughout the year. This year there is a Midewiwin History Gathering taking place at the Three Fires Midewiwin School in Cedar, Wisconsin over the new year. There are always regular language camps, fasting camps, Midewiwin learning-continuing education opportunities, regional ceremonies and gatherings, sweat lodges, etc. In some areas with larger Midewiwin populations (i.e. Bad River, WI, London, Ontario, Mount Pleasant, MI) activities take place on a regular basis. The smaller Midewiwin lodges have annual ceremonies, smaller local ceremonies and come together on special occasions. 11126 West Highway #2, Saxon, Wisconsin. 1:45 p.m. Welcome Feast hosted by the Grand Chief and Family . 3:00 p.m. Special meeting ~ Leadership and T.R.C. 10:00 a.m. Drum Call in: All Midewiwin & Initiates to be present. CLEAN UP Mide School, House, Kitchen, Grounds. Come early to help ready or plan to stay later to help clean up. There is a LOT of work that needs to be done: wood cutting, water truck, snowplowing, kitchen preparation, sweat lodge work, rocks, wood. Lodge repair. Etc. ALL help/helpers are greatly appreciated! Remember to bring you feast bundle. Clans are expected to contribute $250.00 to the cost of the cook, utilities at the Mide School over and above your Clan Feast food/costs. Those wishing to prepare the Healing Bundle (see Sunday Agenda) will need to have these items ready: Burgundy and Black cloth. Burgundy and Black narrow ribbon; seven small black stones and a small (e.g. just a square inch or so) of bear hide. Donations for the Mide Mall: Proceeds from the Mide Mall are applied to cover the costs of ceremonies. Medicines: cedar, sage, sweetgrass, traditional tobacco, copal and charcoal burners, bear root etc. are always welcomed. If you have bear hide to share, bring it. Ceremony feast foods: fish, wild meat, wild rice, traditional corn, staples for the kitchen in general: spices, cooking oils, coffee, tea, maple sugar, maple syrup. Cleaning supplies (environmentally friendly) and tools; serving trays, dish cloths, paper towels, etc., dish-washing station. Feast cloths are often in short supply. Fresh cloths for each feast should be available. If you bring one to use, put your name on it unless you are donating it to the lodge. Bad River Casino 1-800-682-7121 ~ Hotel is fully booked. Gi Guh Waubuh Mi Goo, Neekawnis. Hope To See You Soon, My Mide Relatives And Initiates. FLAGSTAFF, Ariz. — Motivational speaker James Arthur Ray was arrested Wednesday afternoon on three counts of manslaughter for deaths that happened after a sweat lodge ceremony he led in northern Arizona last year. Ray was taken into custody on an indictment at his attorney’s office in Prescott, and was to be booked into the Yavapai County jail in Camp Verde, sheriff’s officials said. His bond was set at $5 million. Ray’s attorneys said Wednesday he surrendered to authorities but that the charges were unjust and they were confident he would be exonerated in court. The Oct. 8 sweat lodge ceremony was intended to be the highlight of Ray’s five-day “Spiritual Warrior” event at a retreat he rented just outside Sedona. He told participants, who paid more than $9,000 each to attend, that it would be one of the most intense experiences of their lives. Two people – Kirby Brown, 38, of Westtown, N.Y., and James Shore, 40, of Milwaukee – passed out inside the sweat lodge and died that night at a hospital. Liz Neuman, 49, of Prior Lake, Minn., slipped into a coma and died a week later. Eighteen others were hospitalized. Neuman’s daughter, Andrea Puckett, said Wednesday she was pleased with Ray’s arrest and the effort authorities put into the investigation. “It helps that he is, for now, being stopped from doing what he’s doing, from harming anyone else, and that’s the biggest relief for me and my family right now,” said Puckett, of Bloomington, Minn.
Ray’s attorneys have said he took all necessary safety precautions and wasn’t aware of any medical problems until the ceremony was over. Ray declined to speak with authorities that night, on the advice of his attorneys, public records have shown. Authorities said they quickly determined the deaths were not accidental and focused their investigation on Ray. They conducted hundreds of interviews that reached into Ray’s past ceremonies and events, including one in which a man fell unconscious during a 2005 sweat lodge ceremony at the same retreat near Sedona. The self-help superstar who teaches people about financial and spiritual wealth uses free seminars to recruit followers to more expensive events. His company, James Ray International, is based in Carlsbad, Ca. Ray’s representatives have said there was no way Ray could have predicted the night’s tragic events. Had he heard any pleas for help inside the pitch-black sweat lodge, he would have stopped the ceremony immediately, Ray’s attorneys said. In the weeks after the deaths, lawsuits accused Ray and the owners of the Angel Valley Retreat Center where the sweat lodge was held of negligence and fraud. Ray’s publisher postponed two book releases, and Ray canceled his appearances amid heavy criticism from survivors. Amayra Hamilton, one of the Angel Valley owners, has said the staff had minimal contact with Ray over the seven years he held sweat lodges there, and that other groups had used the same lodge for ceremonies without any problems. Bunn said she believes the “Spiritual Warrior” events should be called off indefinitely. “It frightens me that I didn’t stand back a little more,” she said.